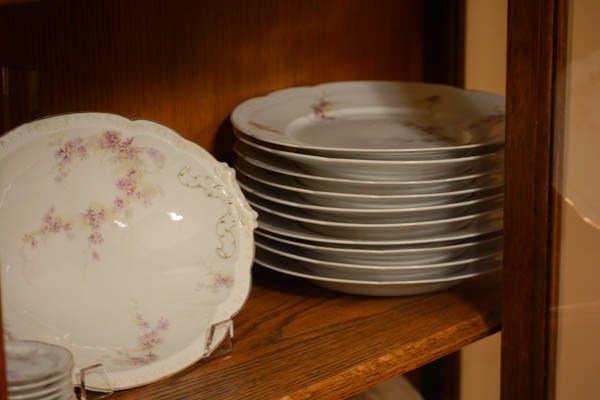 Actually, it’s my great-great Grandma’s china. And since it has been in my possession it has sat safely wrapped and stored. Until today. 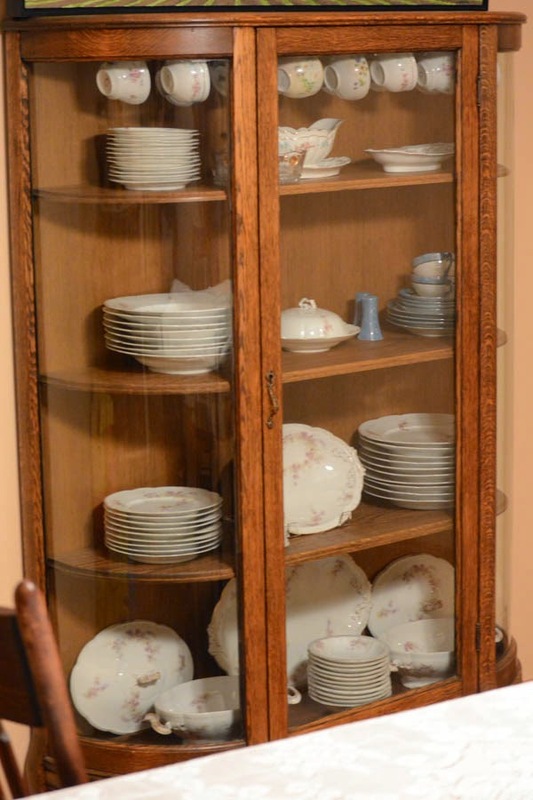 Because having my great-great grandmother’s china in boxes in the basement while a china cabinet sits empty in my dining room is a real waste. I’m still having visions of 100 year old china fragments lying everywhere, but I’m hoping that will pass (and the kids will continue to stay out of the dining room). 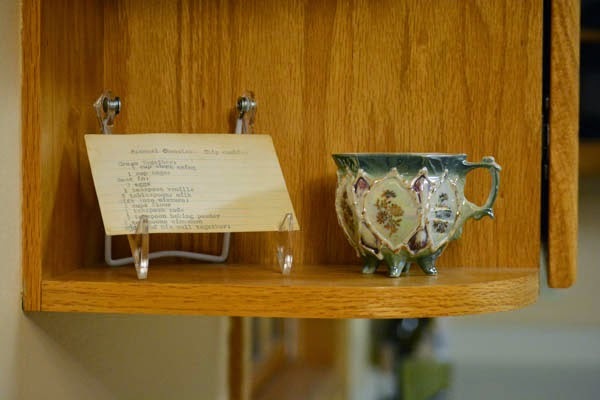 The teacups have been lost and replaced with mismatched ones at some point in history. A few pieces are chipped, some have been broken and mended. A few are from a different pattern. In searching for some information I learned that the stamp on the back refers to the manufacturer and the plate style but I couldn’t find the pattern information. After another couple hours digging online, I found the pattern. The internet can be so amazingly handy. 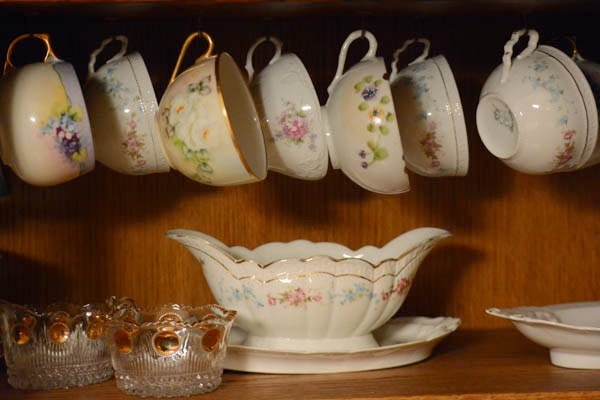 As an added bonus, I had this leftover teacup that didn’t have a hook in the cabinet. I’ve been trying to find a few things to place on these wonky little shelves at the end of my kitchen cabinets because I’m not a decorator and little knick knacks aren’t things I think about so wonky little shelves sit empty for two years and look even wonkier. Anyway, I put this teacup with an old recipe (I need a little frame for it) on one of them and am calling it good. They’re still wonky shelves, but now they are wonky shelves that make me think of having my Grandma in my kitchen. I love this! I always think of my grandma when I am in m kitchen and it makes me feel great. You are lucky you have something of hers. That's a great wonky shelf!